An absolute classic Miniature Tall Bearded Iris in a colour tone I'm quite partial to. Small, compact, well shaped flowers are a very bright red brown blend. Standards are a blend of honey to smooth red . Falls are darker dusky red brown edged with a narrow honey gold of the standards. Bright yellow beard. It is floriferous, and makes a stunning clump. Riverdale Iris Gardens, Minneapolis, Minnesota. 1984 Price List. Rossmore Gardens, Oaklands, Christchurch. Iris Catalogue 2001. PARTURIENT (J. Boushay, 1980) Ruffled red-brown with yellow beards. Limited Supply. 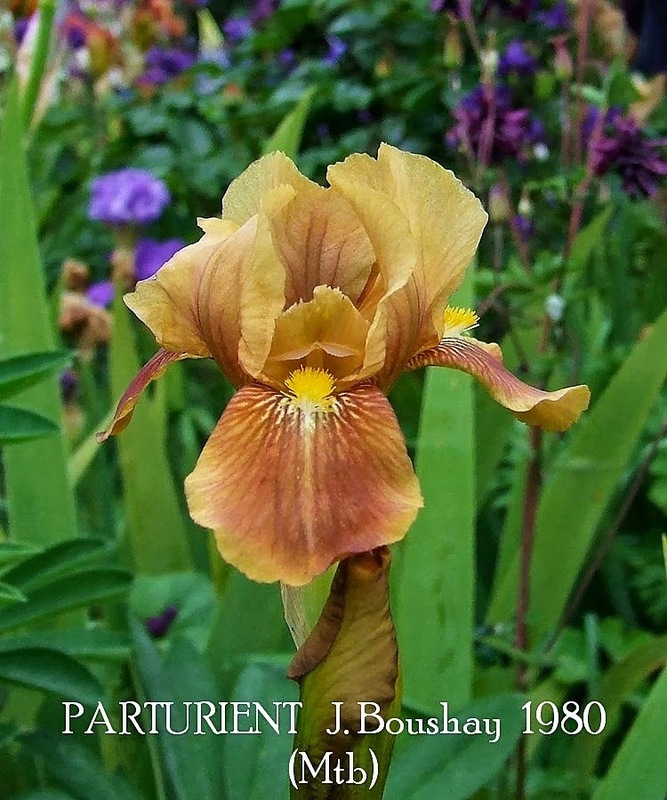 PARTURIENT (J. Boushay, R. 1980). Sdlg. 74-BB-1. MTB, 18" (46 cm), E. S. smooth red brown; F. darker red brown; yellow beard; ruffled. New Idea X Jolly Fellow. J. & J. Iris 1980. As always clicking on the above images will take you to the larger, higher resolution version.